than six months after his unceremonious departure from the wreckage of the banking industry, the former HBOS chief executive is planning to reinvent himself at the helm of Boots, one of the UK's biggest retail brands. The chemist and pharmaceuticals wholesaler ticks all the right boxes for the boy-wonder marketer, whose career suddenly turned sour: as a private company, Alliance Boots will allow Hornby to rebuild his career without the burden of being answerable to public shareholders; and it takes him back to the sector where he spent some of his happiest days, in senior roles at Asda. The appointment is not without potential benefits for Alliance Boots, either. In Hornby, the company has landed an executive who knows what makes retail brands - and, more importantly, their consumers - tick. His move to the Halifax from Asda in 1999 introduced the supermarket concept of shelf-stacked goods into the unfamiliar territory of high-street bank branches. It worked, too: after all, it was not an inability to sell customers mortgages with their current accounts that sent HBOS to the brink. Rather, it was the bank's apparently obsessive zeal for lending to the commercial property sector and the freezing of the wholesale funding market that did for the independence of the country's biggest mortgage lender. he would have been unlikely to desire such a hasty return to the harsh arena of public-company life). That raises questions about the extent to which company bosses can be seen to taint the brands of the businesses they run. Such a risk will not have been lost on Stefano Pessina, who recruited Hornby and will soon become Alliance Boots' executive chairman. Shortly after the appointment had been confirmed last week, Lord Oakeshott, the Liberal Democrats' Treasury spokesman in the House of Lords, accused Boots' owner of ‘failing to learn the lessons of HBOS' collapse' by bringing Hornby in. Adverse comments from one antiquated politician will not worry Kohlberg Kravis Roberts (KKR), the company's owner, too much; however, a series of comments posted online last week suggesting an organised boycott of Boots was now in order would, if sustained, be taken more seriously. Alliance Boots may be privately owned, but it is far from private. The high-street chain is one of Britain's most trusted brands, and unlikely to welcome the publicity that arrives with tarnished corporate reputations. A number of senior managers at the firm are understood to have questioned the wisdom of Hornby's appointment. The City investors who manage the funds behind our pensions would probably have agreed, had they been direct shareholders in Alliance (many of them are indirect investors in the KKR fund that owns the company). Depending on how he performs during the next three years, that may come back to haunt KKR when it decides to cash in on its investment, most probably through a stock-market flotation. Much of the growth that Pessina will depend on to attract a bumper price will come from international business. Yet, so important is the performance of the UK retail operation to perceptions of the health of its parent, that Hornby will not be able to take his foot off the domestic pedal. Hornby's credentials, as well as Pessina's judgement, are about to be tested to the limit. Alliance Boots was formed in July 2006, when FTSE 100 company Alliance UniChem merged with Boots Group. The privately owned company was listed on the London Stock Exchange until June 2007, when it was acquired by AB Acquisitions for 1139p a share. In its preliminary results for the year ending 31 March, Alliance Boots' revenue was up 15.5% to £20.5bn. Established in 1849 by John Boot, Boots opened its first store in Nottingham's Goose Gate, selling herbal remedies. Boots launched its No7 cosmetics in 1935; its Soltan suncare line followed in 1939. Its Advantage Card loyalty scheme, which launched in 1997, has 15m regular users. Alliance Boots employs more than 115,000 people and operates more than 3200 health and beauty stores. In May, Boots Opticians merged with Dollond & Aitchison to form the UK's second-biggest optical chain, trading as Boots Opticians. 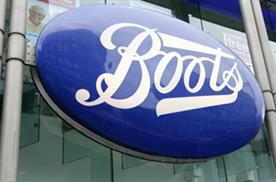 Boots was the UK's 40th-most-loved brand, according to a 2008 Marketing survey.